The UC’s first proposed in-state tuition increase in six years is receiving pushback from newly founded student lobby group University of California Advocacy Network (UCAN), which is stepping up in Sacramento for an additional $140 million in annual state funding for the UC. 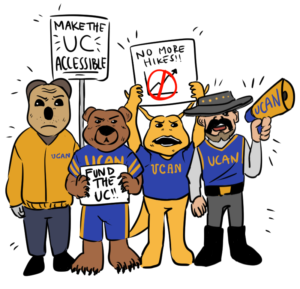 UCAN is an alliance between UC officials and several student ambassadors to encourage faculty and students to take action to fight for affordable education. The organization began as an unnamed subset of the UCOP lobbying department, but over the last two years, UCAN evolved into a distinct group. The organization is headed by six student representatives from various campuses, including UC Santa Cruz student Jonathan Tsou, who also sits on the Student Union Assembly (SUA) as the communications director. “This $140 million will go toward preventing the 2018-19 tuition hikes, helping the university with resources due to increased enrollment and trying to address urgent maintenance needs,” Tsou said. The university is still faltering from the budget cuts made in 2008 following the recession, preceding the university’s tuition hikes in 2011, said UCOP media specialist Stephanie Beechem. Out-of-state admissions quadrupled since 2007 to compensate for low funding, while state funding remained stagnant. However, administrative salaries continued to climb, according to the LA Times. A state audit in 2017 found top-heavy pay increases and an undisclosed fund of $175 million in the UC president’s office. In response, Gov. Jerry Brown withheld $50 million from the UC until they amend the financial problems in the office. The UCOP attributes their financial woes to the lack of state funding increases and enrollment growth. “Without adequate state funding — especially following a six-year tuition freeze — the university faces a number of challenges in maintaining its academic excellence,” Beechem said. The UC Regents meeting in January planned to vote on a 2.5 percent in-state tuition increase — about $340 yearly — but the vote was delayed until May by student protesters, including Judith Gutierrez, the external vice president of UCSC’s SUA. However, the most recent regents meeting in March approved an out-of-state tuition increase of 3.5 percent, about $978 yearly. According to Beechem, the 45-75 percent of Californian UC students who currently receive financial aid will not pay the proposed tuition increase. Most of these students will see their financial awards rise by more than the amount of the increases. At the March regents meeting, UC Berkeley student Rai Joel commended UCAN for its efforts since the regents meeting in January, such as public outreach efforts. Representing UCSC’s SUA, Gutierrez will be meeting with the UCOP’s Finance and Capital Strategies team to assess budget solutions in the coming months. Yet, Joel said there is much left to be done.